Description: Annual herb with 1 or few erect stems, 2-5 dm tall with long-villose, non-glandular hairs mixed with shorter gland-tipped hairs; leaves oblong to lanceolate, unlobed, 3-nerved, 2-4 cm long, with strongly wavy margins and bases clasping the stem; floral bracts unlobed, broadly rounded, wider above than below, wavy-margined, ochroleucous to very pale yellow on the upper third, often fading to dull red with age, glandular-puberulent; primary clefts of calyx 1 cm deep, secondary clefts emarginate; hooded upper corolla lobe (galea) exserted, 5 mm long, green. Flowers July through September. Similar Species: Not likely to be confused with any other Castilleja species in New Mexico. Clearly distinguished by its pubescence, wavy-margined leaves, and unusual bract color. Castilleja minor and C. exserta are the only other annual paintbrushes in New Mexico, and are readily separated from C. ornata by the color of their floral bract tips, which are bright red in the former and pink to magenta in the latter. Distribution: New Mexico, southwestern Hidalgo County; Mexico, western Chihuahua and west-central Durango. Habitat: Flat, seasonally wet areas in arid grasslands; 1,570-2,100 m (5,200-6,900 ft). Remarks: This species is predominantly Mexican and appears to be very rare. It is presently known in the United States from a single location near the New Mexico/Chihuahua border. Conservation Considerations: Seasonally wet areas in otherwise arid grasslands are often severely grazed and trampled by livestock or converted to cultivated cropland. The status of this species in Mexico is poorly known. Recent searches of the few historical collection sites in Chihuahua have failed to locate a single extant population. The Mexican sites visited had all been fully converted to agriculture. This may be a globally endangered species. Until other Mexican populations can be located, the New Mexican site should be considered the only extant population. A 2017 survey only documented 2 plants in the only location reported from the United States. Eastwood, A. 1909. Synopsis of the Mexican and Central American species of Castilleja. Proceedings of the American Academy. 44:565-591. McIntosh, L. 1994. 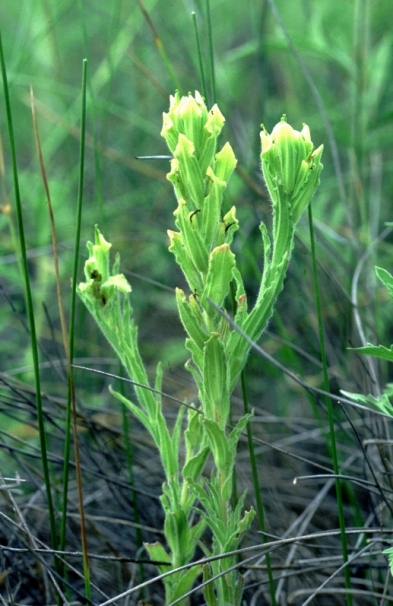 First report of Castilleja ornata (Scrophulariaceae) from the United States. Phytologia 76(4):329-332. Roth, D. 2017. Swale painbrush (Castilleja ornata). Status survey report. Unpublished report prepared by the NM Energy, Minerals, and Natural Resources Department, Forestry Division, for the U.S. Fish & Wildlife Service, Region 2, Albuquerque, NM. Information Compiled By: Robert Sivinski, Mark Egger, 1999. Updated 2018.